"The right shoe for the race ..... again!" Sneakers were developed in response to a variety of needs. All equine athletes stress their feet and legs. Because of the sheer miles on a variety of terrains, endurance horses were the perfect venue to test the Sneakers. 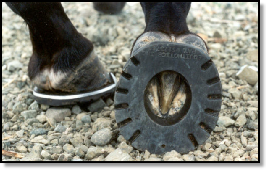 If the shoe performed well in the extreme use of endurance riding, horses in other disciplines would benefit.